This reflection piece came about after chancing upon Teach With Your Strengths by Gallup Press and my recent discovery of my top five strengths upon completing the Gallup StrengthsFinder assessment (Responsibility, Relator, Empathy, Connectedness and Restorative). One of the discoveries I've made about StrengthsFinder is that our strengths at infancy are expressed negatively and our strengths at maturity are expressed positively. There are times when the same strength at maturity can fall into infancy under stressful situations. Our strengths are not static in nature. A large part of this reflection focuses on the different times that my strengths were displayed, either in infancy or maturity. I've recently left the teaching profession after being in it for the past four years. I was teaching in a secondary school in Singapore. I'll be elaborating in greater detail all five of my strengths on how they have influenced my personal development as an educator. I grappled with work-life balance at the start of my career. My weekends were mostly spent at home, marking, planning for lessons and recharging after a tiring week in school. I spent considerable time creating and perfecting learning materials. I enjoyed having the ownership to plan and design my own lessons. Life as an educator was fruitful, but it was also draining when I did not know how to manage my work and personal life. I grew exhausted of what I was doing a year into the profession. I was overwhelmed with so many responsibilities and questioned my own place in the teaching fraternity. There were periods in the school year when I experienced burnout from battling piles of work. Guess what, I wasn't the only one who could see that happening..
One of my colleague asked me this while I was preparing teaching and learning resources at my desk. I didn't think that anyone would have realised that about me, or even to tell me about it. I didn't know when it began. It could have been the accumulation of fatigue, gradually seeping into my mind and body as time passed. This was my Responsibility strength in Infancy = it had negatively impacted my life. As an educator, I wanted to be responsible for my students. I committed my time and energy to all the work associated with teaching and learning. I feel energized when I have full ownership of my tasks. I knew that it was important to first take care of myself before caring for my students. Happy teachers create happy and healthy classroom environments. In retrospect, amidst the occasional burnout, my students and colleagues were the constants who kept me going. Educators with Responsibility in their top 5 StrengthsFinder results, like me, may perhaps share similar experiences. Here's a reminder to always remember to practise self-care habits! When I first started out as a Beginning Teacher, I felt uncomfortable being in a new environment, meeting unfamiliar faces who I had to take time to learn about - their individual traits and personalities, working styles and interests. I grew aloof while trying to embrace the unfamiliarity. I needed a lot more time to warm up to my colleagues and students. This was my Relator Strength at the infancy stage. It was important for me to reach out to my students personally. I enjoyed having smaller group conversations with students to get to know them better. My favourite meeting spot was where the wooden tables were, right beside the school pond. I still remember this conversation I sat in with two students. It was about learning, accepting and speaking the truth. Both of them were anxious. His voice shook as he tried to find the right words to say. His classmate sat with his palms clasped tightly together while listening to what his friend had to tell him. It was difficult and uncomfortable for both parties when we came to a point when it struck a raw nerve. We took the time to listen to each other, revealed the truth amidst the discomfort and walked away knowing that there would be another chance to do things right again. As a Relator at its maturity stage, I became more comfortable with my students , revealed more about myself and expressed my feelings. We began to gain a better understanding of each other. I also shared with them my thoughts, regrets and aspirations for the future. Deep relationships are important to educators with Relator in their top 5 StrengthsFinder results. We want to know more about our students’ passion, habits and interests that lie outside of the classroom and beyond their test scores. Foreign and unfamiliar content pique my students' curiosity. Being an avid reader and traveller, I used my strength of Connectedness to expose them to a plethora of global perspectives. I recounted the nightmarish experiences of navigating through the traffic in Hanoi when we discussed elements in Descriptive Writing. I also shared my curious obsession with North Korea before we worked on Grammar editing on that topic. My strength was at its maturity stage as I attempted to make many visible connections. I continued to make more explicit links for them. During a Character and Citizenship Education (CCE) lesson on Racial Harmony, we spoke plainly and openly about the racial stereotypes we had of the four groups groups of people. We came to a conclusion that there are many false assumptions and misinterpretations made of different groups of people. It was one of the most productive and meaningful discussions we had. Educators with Connectedness in their top 5 StrengthsFinder results strongly believe in making learning relevant to students, adopting a multidisciplinary approach in their lessons and embracing different cultures across borders. I faced classroom management issues because I was “too nice” to my students. That was Empathy at its infancy stage. My students took advantage of certain classroom situations - talking when their classmates are speaking or answering a question and or being disengaged due to various distractions. As I progressed with more guidance from my teacher mentors, I learnt that I needed to be firm with my decisions and set clear expectations. They advised me to be aware of my rationale behind what I wanted for my students to develop my own management style. What happens if they do not submit their homework? What are the implications if my students talk during a lesson? What must I do to ensure that the classroom is a safe and conducive environment for learning? It was crucial that I was resolute in terms of my decisions and think logically such that my emotions will not be swayed. This was how I dealt with Empathy in its infancy stage. On the other hand, my strength of Empathy guided me towards creating a culture of mutual understanding. It was essential that my students learn to empathise with their classmates. At this point, my strength was at its maturity stage. I recall a time when my class had to deal with issues of cyberbullying and name-calling, or the creation of undesirable nicknames. These issues were so sensitive that it must have taken a lot of courage for students to admit that they were bullied. We have vulnerabilities and anxieties that we do not tell others about because we are fearful of exposing our weaknesses to others. We build walls to protect ourselves and sometimes, appear hostile so no one will try to confront us to bring us down. Likewise, our students are undergoing identity exploration in their adolescent years that may leave them confused. It's important that we understand them and address those unvoiced questions, as well as create a conducive classroom environment for all. No one should be left to struggle through the learning process or school alone. The ability to recognise and understand their students’ emotional and physical needs is vital to educators with Empathy in their top 5 StrengthsFinder results. There were times when I struggled with student engagement too. I felt that I was letting my students down. My strength was at its infancy stage when I started focusing too much on my weaknesses. It was an exhausting process reflecting on the not-so-good lessons days and the possible modifications to be made. I knew that I needed to act upon them, find solutions and not dwell on the past or focus on my mistakes. What went wrong during the lesson? Why were the students disengaged? Was it because I was not engaging enough? What can I do to make learning better and more interesting for them? Did they understand the lesson? What can I do to check if they have understood? What happened just now? Should I be stricter? Should I make my expectations clearer? What can I do better the next time? I struggled with my English Language class at the beginning of my second year. My students did not seem to be enjoying lessons. It felt like we were merely going through the motions. I needed to find out the root of the problem. I wanted to know what they were feeling. I asked them to write down their responses to questions that I had for them. I wanted them to be honest with me even though I was unsure of how I was going to cope. At this point, my ‘Restorative’ strength was at its maturity stage. “It’s okay if I struggle with English Language as long as I enjoy the lessons." After reading through their responses, I realised a significant number of them did not enjoy their lessons. Those who liked reading did not like them either. It tugged at me, knowing that they were disinterested even though they were doing fairly well. It was heart-wrenching. I consolidated their responses and we discussed openly their suggestions for future sessions. I was heartened to know that they grew increasingly positive and responsive within weeks. They were putting more effort in their work. They grew livelier. We explored Visual Texts through a theme on caring for the disadvantaged with case examples on the Salvation Army. We used a music video featuring Coldplay’s Paradise to identify its narrative plot structure. We collated individual descriptive paragraphs using Google forms as a platform. We went through them and gave constructive feedback as a class. They listened for feedback and improvements. I was glad that things worked out in the end. Educators with Restorative in their top 5 StrengthsFinder results may have experienced trying periods in their attempts to resolve conflicts with themselves and their students. However, they achieve the greatest sense of fulfilment when problems are successfully unriddled. Sometimes, we're so overwhelmed with preparing for lessons and clearing our marking load that we neglect the time spent to make learning more interesting and meaningful for our students. How about taking some time to ask yourself this: When you were a student, what is it that you wanted most from your teacher? 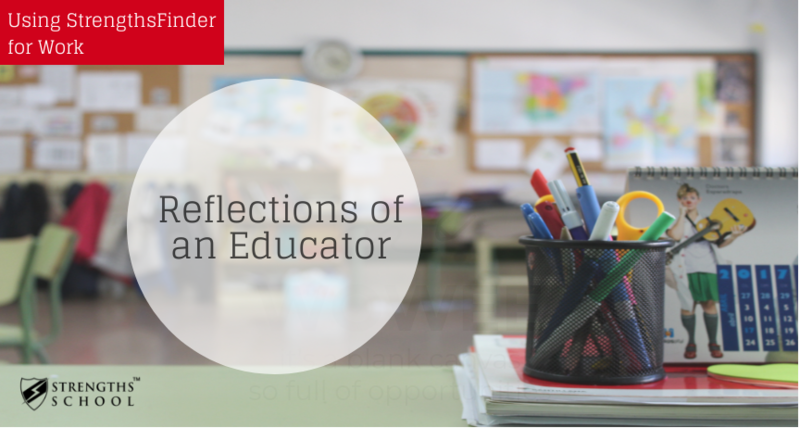 I believed in what I stood for and was aware of my core purpose as an educator. Being clear about our goals and what we want for our students helps guide us on the ways we educate them. As I recall all these experiences, I learnt that my strengths played a part in my decision-making process. There were times when I faltered, but these experiences have also made me grow as an individual. At the end of the day, my students taught me how to be a better teacher for them. “The best thing about being a teacher is that it matters.